Roofdrain green roof drainage and water storage layer is comprised of a HDPE core laminated to a geotextile filter. It is suitable for use on horizontal and sloping green roof surfaces. The core acts as a water reservoir, holding 4.5-5.5 litres of water per square metre that can then be released slowly, used as grey water or used as irrigation for the vegetation mat. The core is perforated to allow excess rainwater to flow into the underside and away to drainage outlets. 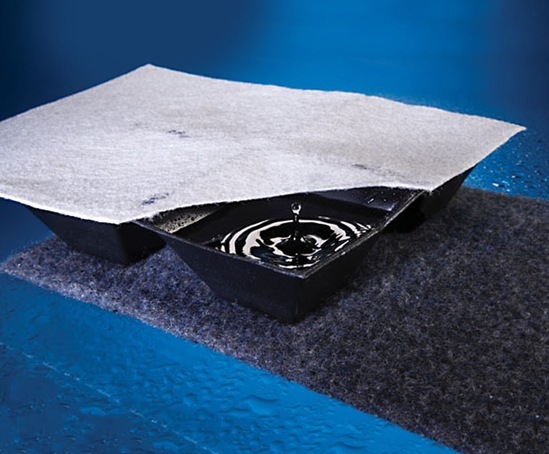 The upper geotextile prevents any fine particles from the substrate blocking the drainage layer. A zero breakthrough head prevents over-saturation of the substrate. The lower textile is a fleece layer that protects the waterproof membrane and acts as an extra moisture retentive layer. It can hold an additional 1.0 litres per square metre to further enhance the storm water attenuation benefits of the system.